The products we offer have been carefully selected for quality and functionality to insure the highest level of customer satisfaction. We know it is sometimes hard to commit to a purchase when you cannot see and feel the actual product at hand. By offering only the highest quality goods we insure that you won't be disappointed when your order arrives. This strategy (developed by LL Bean) eliminates both returned goods and disappointed customers. In fact our return rate is virtually zero, an unheard of number in the on-line industry! 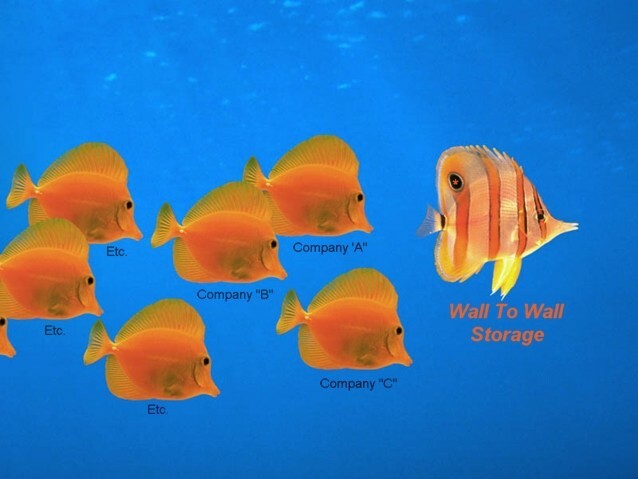 The Wall To Wall Storage agent who handles your inquiry will be your assigned customer representative for the life or your order. They will answer all your questions and resolve all problems regardless of the issue. No more explaining your situation over and over again each time you call or get transferred because no transfer will occur! We are NOT a large impersonal corporation that cares more about numbers than customers. Your satisfaction come first and in fact; it's guaranteed! We strive to give our customers the best price possible. On very rare occasion you may find an identical item on sale for less at a competitors site. Just let us know the details and we will meet or beat their delivered price*. As dad used to say " a penny saved is a penny earned"! We have been in business for several years and our staff is completely schooled in all areas concerning storage products, services, and ideas. This is currently a hot industry and it seems that every day somebody is starting a new company to try to emulate ours. While the vast majority of these individuals are sincere they simply haven't yet acquired the needed experience, industry contacts, or resources necessary to insure your complete satisfaction. As dad used to always say "dance with the one who brought ya'"! We are committed to being completely honest and forthright in all dealings with our customers, suppliers, and other business associates. How can this policy directly benefit you? Well, for instance at the time of this writing a particular popular line of cabinets we carry is out of stock due to factory production issues by the manufacturer. When we were notified of this issue we immediately posted an out of stock message on our website. When we checked all our competitor's websites who carry this same line not a single one had mentioned that these cabinets were unavailable! Imagine the disappointment of their customers who went ahead and placed orders only to find out later that their items wouldn't ship until six weeks later! As dad used to say "honesty is the best policy"! *See our policies and procedures page for complete details.